On October 20, 2017, King Felipe and Queen Letizia attended an audience, with awards winners ahead of the 2017 Princess of Asturias Awards ceremony. The Princess of Asturias Awards are given every year to personalities or organizations from all around the world who make significant achievements in the sciences, Arts, Literature and humanities. 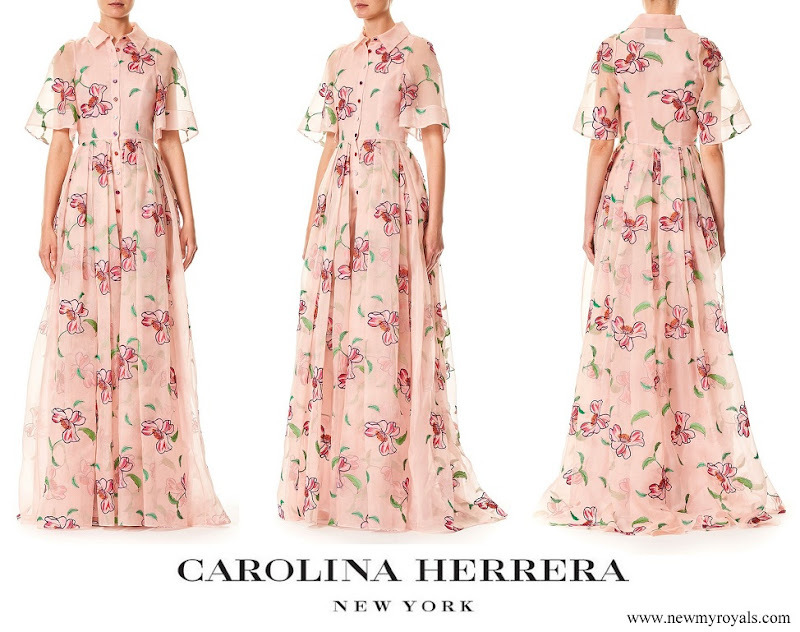 Queen wore a Floral Embroidered Organza Dress by Carolina Herrera. Only one complaint! Why can't it be the long dress? She could rock a tiara with the evening version. Love this look. I much prefer the shorter version. 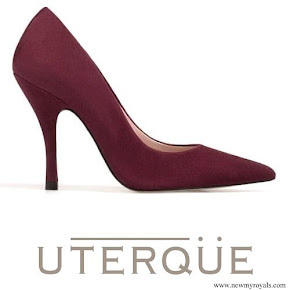 It´s fresh and youthful, feminine and elegant. The long version has so much fabric that I think it would overwhelm Letizia, and it gives me slight nightgown vibes. Whatever she wears, Letizia looks wonderful! And those earrings! Gosh what a wonderful dress! She is nailing it with this dress! She seems to be changing her style a bit towards a softer look. I love it! 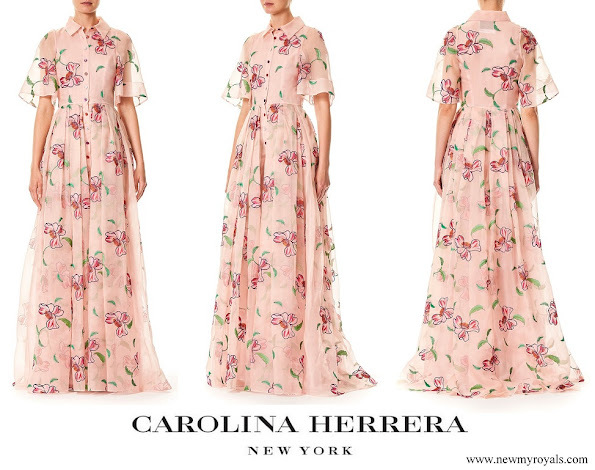 I think she was wise to wear a shorter version (with slim long sleeves) as this sort of floaty floral edges into nightdress territory when it's floor length. She is truly the most spot on of all the ladies! Fresh and flattering dress. Perfect hairdo. Nice acessories. Suits well for the event. Handsome King, as always. Esta preciosa. Me encanta cuando lleva telas con estampados, la hace más dulce. Stunning - another hit from the Queen. I love these softer floral dresses she is wearing at the moment. A sublime dress for a sublime Queen. 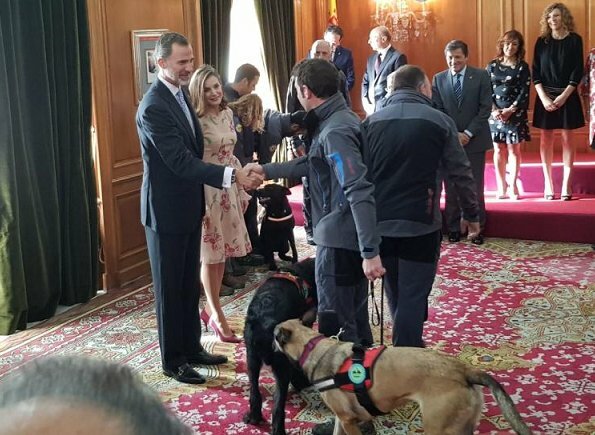 Letizia es una mujer fuerte, de gran personalidad, pero tiene la apariencia de un hada cuando viste estos bonitos vestidos delicados y femeninos. Bellísima.